Allows you to stock one product to fill the needs of two. 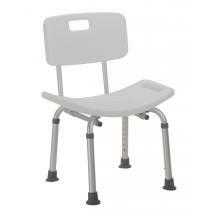 Heavy duty molded plastic construction provides additional strength and durability. Clamping mechanism ensures secure locking onto toilet. Nylon capped nut and bolt construction. Grab Bar with Suction Cups 12.75"
-Portable, quickly and easily installed on virtually any smooth surface without tools. -Provides assistance and added safety to the home or when traveling. -For use on a shower wall, in the bath mounted on the tub, for use as a temporary towel bar, near a chair or stairwell for assistance when standing or climbing stairs. -Large suction cups (4.5") provide superior adhesion properties. 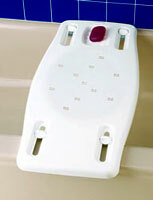 -Release levers make installing and removing the suction cup grab bars easy. Caution: The suction cup grab bars are to be used as balance assist only. They are not for body weight leverage. Assembled, 1/cs Heavy duty aluminum construction. Designed for shower usage or larger tubs. Comes with locking suction cups. Ideal for use in a stall shower. 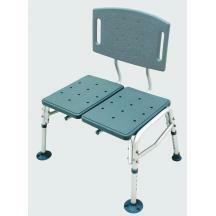 Toolless removable back is extra wide for patients comfort and support. All purpose Dual Shower/Transfer Bench. 3"x1 1/4" Heavy Duty Threaded Stem Casters. 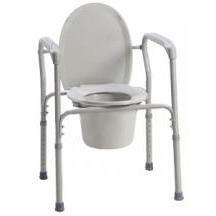 Bolts securely to the toilet to provide security and stability while getting on or off. 1" anodized aluminum tubing with skid-resistant rubber tips. Height adjusts from 26(3/4)-30(3/4)"; width adjusts from 17-19(1/2)". Weight capacity: 300 lbs. Lifetime limited warranty. The elevator fits under a regular home toilet seat. There are two models, one fits a standard toilet and one fits an elongated toilet. 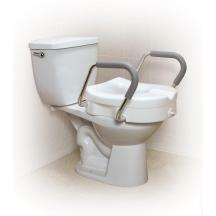 Works in conjunction with existing toilet seat and lid for a non-prosthetic look. One-piece construction means easy cleaning and no corrosion. 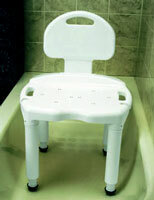 Adjustable width fits all standard tubs 19 - 28"W. Rubber stops protect tub and provide secure placement. Built-in soap dish with drain holes. 14(1/4)"L x 2"W x 31"H. Weight capacity: 300 lbs. Lifetime limited warranty. Compact design fits into virtually evey tub and shower--whether at home or away. 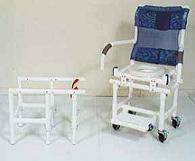 Leg levelers ensure custom, firm fit with any tub or shower floor without wobble. Built-in hygienic opening, hand-held shower holder, and carry handles. Sturdy, monoblock construction has no metal parts to corrode. Assembles and disassembles quickly without tools for easy transport and storage. Choose with or without backrest. Weight capacity:400 lbs.